It seems that Jennifer Aniston and her fiancé Justin Theroux will not be a family of three after all. Recent reports have confirmed that they will actually be a family of FOUR! Yup, following in the fashion of starlets who do not want the burden of multiple pregnancies over time, Jen will be having multiple babies at once. Lucky her! This was all scheduled around her next ROM-COM I’m sure. “Jennifer was talking about wanting twins ages ago, and as it turns out, Justin has always wanted to have them too. She was beyond excited the moment she found out. ‘I’m so thrilled,’ she keeps telling her friends. The fertility treatments weren’t easy on her — but it looks like they paid off,” says a source to OK! Magazine. Though the couple had been undergoing fertility treatments which were reportedly rough on Jen, they are definitely happy with the results. Lucky for Jen and Justin, they will be having a boy (to rock Justin’s bad boy style) and a girl (to bring “The Rachel” back). What more could they hope for? Jen’s BFF’s, Courtney Cox and Chelsea Handler, were ecstatic over the pregnancy news and were probably fighting over who would be the godmother to the baby. Ladies, there are enough fetuses to go around. As Jen is Courtney’s daughter Coco’s godmother she is probably over-joyed to return the favor. Sorry Justin. You won’t have a say in who your children’s godparents are. You are just there to donate the spermies. Be on the lookout for an official pregnancy announcement close to the end of Jen’s 2nd trimester as she is so superstitious, she doesn’t want to say anything too soon and jinx things. What do you think readers? 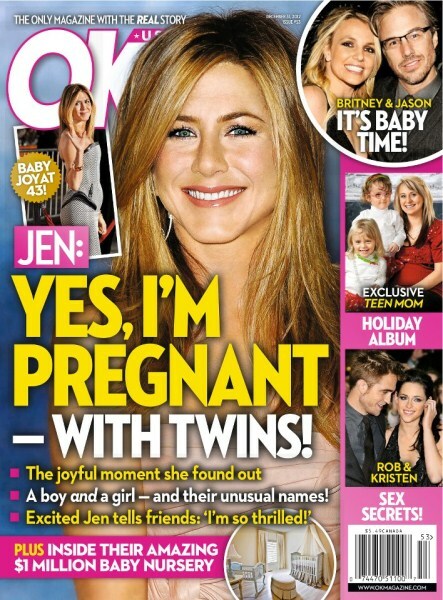 Will Jen be a good mom? What should she name the kids? Does Justin’s presence even matter at this point? Will they still go ahead with the wedding?